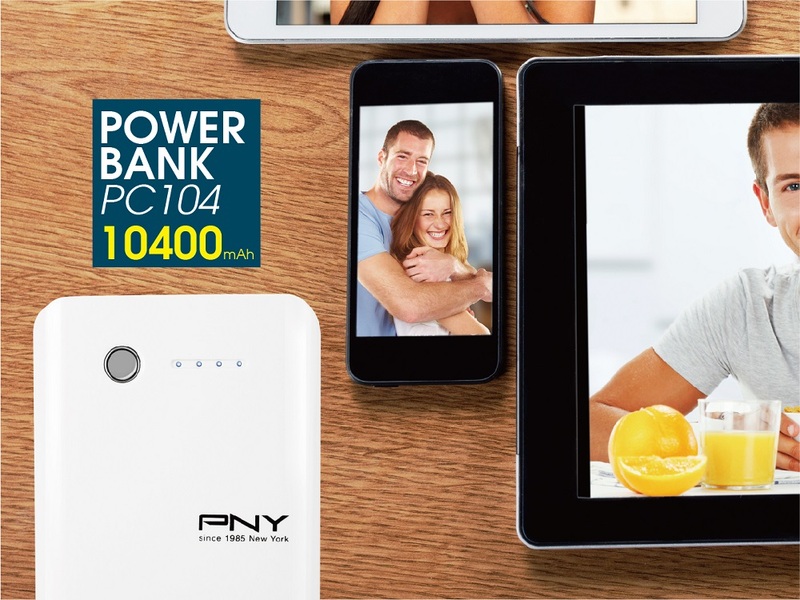 PNY Technologies (PNY) considered one of the worldwide leaders in consumer electronics market and flash memory products, introduces its popular and fast-selling power banks to the Philippine market, models PC104/T531/BE840. Power banks for mobile phones has now become a must have gadget for all smartphone users. Despite smartphones having their own standard battery life, daily usage like internet browsing, music playback, watching videos, attending and making calls and constant text messaging always makes the battery drain very fast. So to keep our mobile phone going on, we all need a power source that lasts for the day and keep our busy and engaging life always on-the-go. That’s where the power banks have become a necessity. PNY’s power banks possess all the requirements and specifications needed to keep our smartphones charged up and ready throughout the day. These power banks deliver outstanding battery life for your depleted mobile battery with power range ranging from 10400 mAh, 10000 mAh and 5300 mAh capacity to suit your battery preference. The Power-T531 is a slim power bank which comes encased in high-quality matte metallic casing and is available in two striking colors-silver and gold. Physical dimensions of the device read 120mmX 60mmX 11.6mm and it weighs around 157 grams, making it extremely lightweight and portable enough to be carried around during commuting or daily outdoor activities. The Power-T531 is backed with Li-Polymer battery which is safe and reliable and comes charged with 5300 mAh capacity. The power bank charges one smartphone at a time with micro USB input DC 5V 2A max and USB output DC 5V 2.1A max. 4-lights LED indicator displays the status of battery level while charging and on/off button helps in preserving the battery charge when no unit is connected. It supports almost all smartphone devices available in the market and is ideal for most digital devices with DC 5V input, such as iPad, smartphones, tablets, iPhone, iPod, MP3/MP4 and etc. 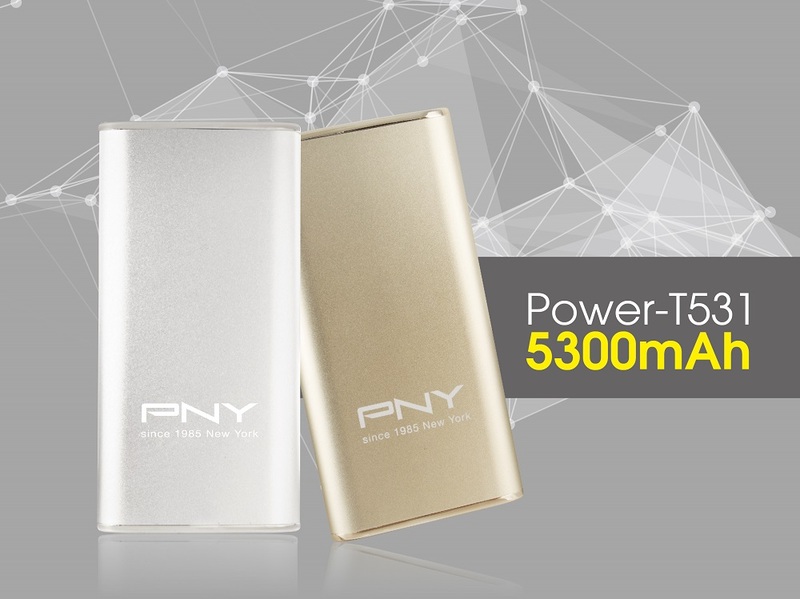 The Power-T531 is backed with PNY’s warranty of one year. 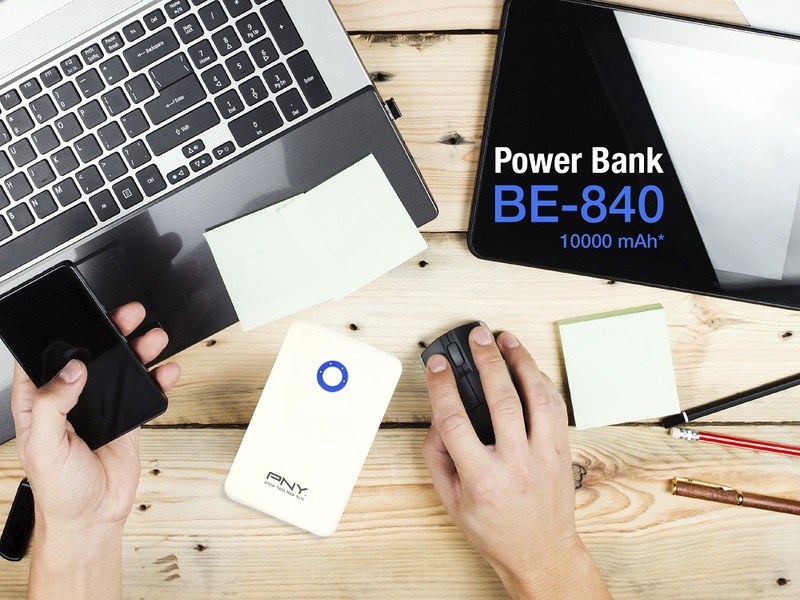 The PC104 is a powerhouse portable charger with a whopping 10400 mAh battery capacity. It provides up to 8 hours of battery life for your mobile phones. With its stylish and ergonomic design, the PC104 is a pleasure to carry along. Physical dimensions read 102mm X 72mm X 26mm and it weighs around 253 grams. It is available in black and white color. Its square and tough design makes it extremely reliable and safe to be used outdoors and travelling long distance. The device charges two smartphones simultaneously, thus saving you time and get the added benefit of using two devices whenever you want. It features an on/off button and 4-lights LED indicator displays the status of battery level while charging. It supports almost all smartphone devices such as iPad, smartphones, tablets, iPhone, iPod, MP3/MP4 and etc. The PC104 is backed with PNY’s warranty of one year. Arguably one of the most stylish power bank of all time, the BE-840 is a good-looking power bank with trendy and refined design. It comes in an all-white casing with blue LED light indicator at the middle. The BE-840 features a compact design, is super portable, easy to hold in your hand and can be put anywhere you want, e.g. a pocket or a bag. With its ergonomic design, it easily fits into your palm. The device consists of non-recycled Lithium-ion batteries with powerful 10000 mAh battery capacity. It features dual output ports that can charge two devices simultaneously and efficiently. It comes with four high efficiency LED indicators that help you keep track of the battery level. As an auxiliary application, it carries a handy built-in LED torch. Physical dimensions of the unit are 112.8mmL x 72.0mmW x 22.0 mmH. It tilts the scales at 281 grams. The device also features auto shut off when no unit is connected. This helps in preserving the battery charge. It supports almost all smartphone devices such as iPad, smartphones, tablets, iPhone, iPod, MP3/MP4 and etc. The PC104 is backed with PNY’s warranty of one year. All the above PNY power banks are equipped with multiple safety features including overcharge protection, over current protection and short circuit protection among others. 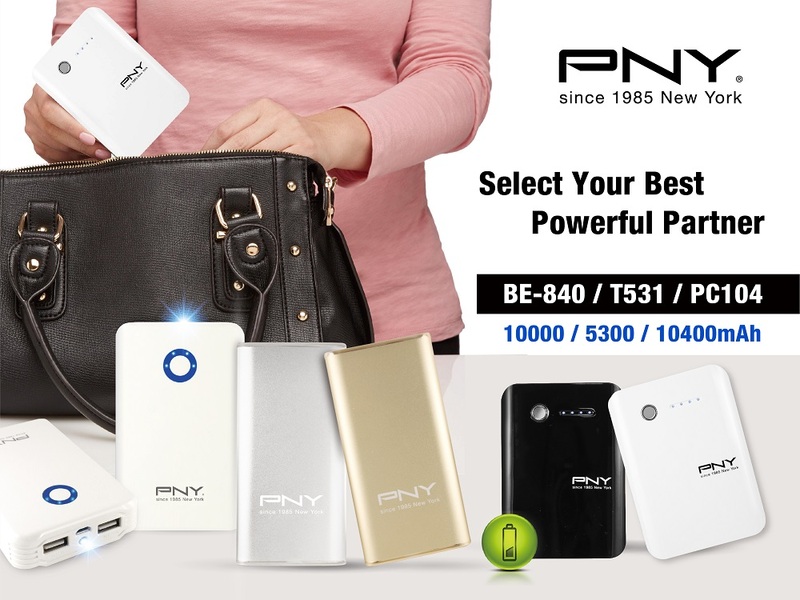 PNY’s power banks meet all standard quality requirements and come with CE, FCC, UN38.3 certifications.